On August 31st, 2016 in the hall of the Pirot Cultural Centre an award was presented by the leading European organisation for cultural heritage protection, Europa Nostra. The award was presented for the conservation study of the village Gostuša, in the category of research studies performed by the Niš Institute for the Protection of Cultural Monuments. For the first time such a prestigious award was presented recognising a project from Serbia. In Madrid in May of this year, a director of the Niš Institute for the Protection of Cultural Monuments and a native of Pirot, Elena Vasić Petrović received the award. 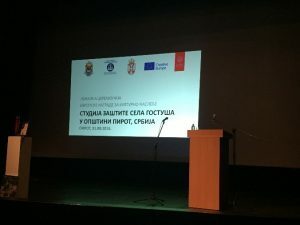 The European Union and Europa Nostra awarded the conservation study of the village Gostuša, the first of that kind intended for a project in Serbia. More importantly, this award was presented to a region in Serbia with a rather inchoate awareness of the development of cultural heritage, struggling with the lack of funding, especially in the field of culture. Our heritage is very precious indeed. Thus, we need to make more effort to preserve and protect it. We are further encouraged by the award which signifies that Europe recognises that which is truly valuable. On the Stara Planina Mountain a seminar was held regarding the aforementioned topic and it gathered a large number of experts from all over Serbia, Republika Srpska, and Bulgaria. The so-called stone village needs further protection against decay by conserving certain buildings, as well as by increasing awareness of the few remaining residents of the value and protection of immovable cultural property of this mountain village in the heart of an unscathed beauty of the Stara Planina Mountain. The ceremony was attended by H.E. Ambassador of Australia Julia Feeney, as well as by representatives of the Embassy of Bulgaria, of numerous ministries, and of the European Union and Europa Nostra.